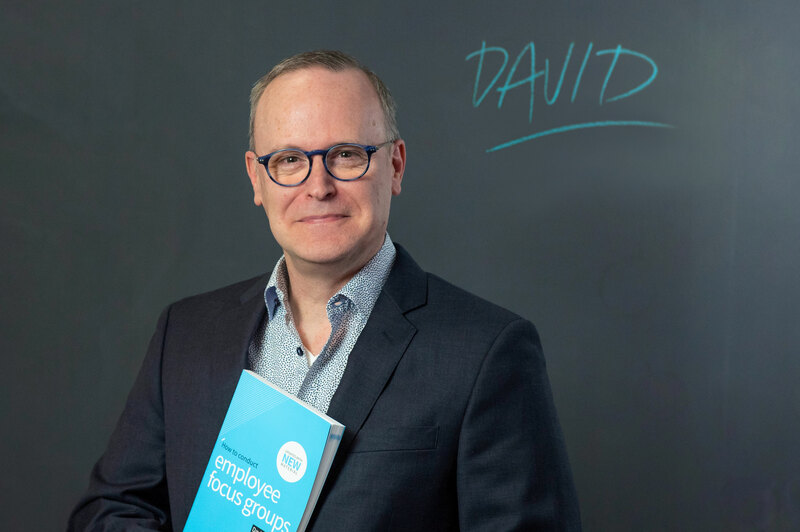 David's focus on simplicity and listening to employees’ ideas are key principles of Davis & Company's employee-centric approach. He leads our consulting team to ensure we’re delivering innovative solutions for our clients’ internal communication challenges. As our measurement practice leader, David also helps our clients demonstrate the value of their work. He is author of How to conduct Employee focus groups (2017) and writes about measuring employee communication on the Davis & Company blog. An experienced speaker on communication issues, David has conducted workshops for The Conference Board, International Association of Business Communicators, Society for Human Resource Management and Institute of Communications and Advertising. He holds a bachelor’s degree in instructional media from Ryerson University (Toronto) and an MBA in design management from the University of Westminster (U.K.). Focus groups with employees always make me smile. The insights are genius and inspiring. And when changes are made based on employees’ feedback, I’m even happier. Design. When a product, an organization or even an experience is well designed, it’s easy to understand and it works as it should. Capturing all the questions you have on a topic within two minutes. There’s always a question (or two) that inspire a new perspective. When I’m blocked, I create a mind map—a summary of the bits of information that I have. This helps me understand what I’m missing and what’s critical to include. Woodstock, Ontario, Canada (outside of Toronto)—the dairy capital of Canada. Moo! Look at art—museums, galleries, installations—you name it. I live for abstract expressionism. Olivia Newton-John’s Clearly Love—don’t judge me, please. I’m such a movie geek that one of my categories on Netflix is “intellectual foreign drama.” I don’t have ONE absolute favorite, but lately I’ve been enjoying documentaries about the art world. Surround myself with beautiful paintings and talk to the artists who created them. Definitely butterscotch, but coconut is a close second. If they’re both in the same bowl, even better. Too many surveys in your organization?